Jordans, Eva., Ngweno, Bettina, Spencer-Oatey, Helen. Developing Global Leaders: African Case Studies. New York: Palgrave. Spencer-Oatey, Helen, Kádár, Dániel Z. Intercultural Politeness. Cambridge: Cambridge University Press. Debray, Carolin & Spencer-Oatey, Helen (2019) 'On the same page?' Marginalisation & positioning practices in intercultural teams. Journal of Pragmatics, 144: 15-28. Open access to the article here. Spencer-Oatey, Helen & Dauber, Daniel (2019) Internationalisation and student diversity: How far are the opportunity benefits being perceived and exploited. Higher Education (online first). Open access to the article here. Spencer-Oatey, Helen & Dauber, Daniel. (2018) Internationalizing the student experience. In: Teixeira, P.N. and Shin, J-C. (General editors), Encyclopedia of International Higher Education Systems and Institutions, sub-section Higher Education as a Global Reality. Springer. Spencer-Oatey, H. & Zegarac, V. (2018) Conceptualising culture and its impact on behavior. In C. Frisby & W. O’Donohue (Eds.) Cultural Competence in Applied Psychology: An Evaluation of Current Status and Future Directions. New York: Springer, pp.211–242. Spencer-Oatey, Helen. & Zegarac, Vladimir (2017). Power, solidarity and (im)politeness. In: J. Culpeper, M. Haugh & D. Kádár (eds.) Handbook of Linguistic Politeness Research. Basingstoke: Palgrave Macmillan, pp.119–141. Spencer-Oatey, Helen, Dauber, Daniel, Jing, Jing, Wamg Lifei. (2017). Chinese students' social integration into the university community : hearing the students' voices. Higher Education, 74 (5), pp. 739-756, View full article. Spencer-Oatey, Helen. (2016) Planning a collaborative workshop: Negotiating preferences and achieving synergy. In: C. Barmeyer and P.Franklin (eds.) Intercultural Management. A Case-based Approach to Achieving Complementarity and Synergy. Basingstoke: Palgrave Macmillan, pp.38–50. Reissner-Roubicek, Sophie (2015). Teamwork and the 'global graduate' : negotiating core skills and competencies with employers in recruitment interviews. In: Angouri, Jo; Marra, Meredith; Holmes, Jane; (ed. ), Negotiating Boundaries at Work. Edinburgh University Press, pp.66-86. Spencer-Oatey, Helen (2015). Politeness and rapport management. In: Bennett, J. (ed.) The Sage Encyclopedia of Intercultural Competence. Thousand Oaks: Sage. Spencer-Oatey, Helen (2015). Rapport management. In: Tracey, K. (ed.) Encyclopedia of Language and Social Interaction. London: Wiley. Spencer-Oatey, Helen. & Harsch, Claudia. The critical incident technique. In: H. Zhu (ed.) Research Methods in Intercultural Communication. London: Blackwell, pp.223–238. Wang, Jiayi & Spencer-Oatey, Helen (2015). The challenge of building professional relations across cultures: Chinese officials in America. In E. Christopher (Ed.) International Management and Intercultural Communication. A Collection of Case Studies. Vol. 1, (pp.90-107). Basingstoke: Palgrave Macmillan. Spencer-Oatey, Helen and Franklin, Peter (2014). Intercultural interaction. In: C. Chapelle (Ed.) Encylopedia of Applied Linguistics. London: Wiley. Reid, Stuart & Spencer-Oatey, Helen (2016). Towards the global citizen: Utilising a competency framework to promote intercultural knowledge and skills in HE students. In: J. Ryan (ed.) Cross-Cultural Teaching and Learning for Home and International Students: Internationalisation of Pedagogy and Curriculum in Higher Education. Abingdon: Routledge, pp. 125-140. Reid, Stuart & Spencer-Oatey, Helen (2012). Beyond stereotypes: Utilising a generic competency approach to develop intercultural effectiveness. In: V. Carayol & A. Frame (eds.) Communication and PR from a Cross-Cultural Standpoint. Brussels: Peter Lang, pp.15-30. Spencer-Oatey, Helen (2012) Maximizing the benefits of international education collaborations. Managing interaction processes. Journal of Studies in International Education, 17(3), pp.244-261.View. Spencer-Oatey, Helen, Isik-Guler, Hale, & Stadler, Stefanie (2011). Intercultural communication. In Handford, M. & Gee, J. (eds) The Routledge Handbook of Discourse Analysis. London: Routledge, pp.572–586. Spencer-Oatey, Helen (2010) Intercultural competence and pragmatics research: Examining the interface through studies of intercultural business discourse. In Trosborg, A. (ed.) Handbooks of Pragmatics (HOPS): Vol.7: Pragmatics across Languages and Cultures. Berlin: Mouton de Gruyter (pp.189–216). 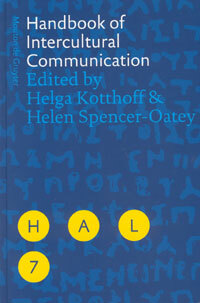 Kothoff, Helga, Spencer-Oatey, Helen (eds) (2009) Handbook of Intercultural Communication. Berlin: Mouton de Gruyter. 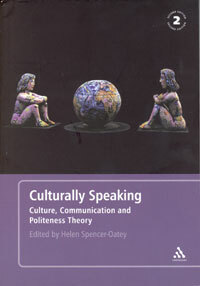 Spencer-Oatey, Helen, Franklin, Peter (2009) Intercultural Interaction. 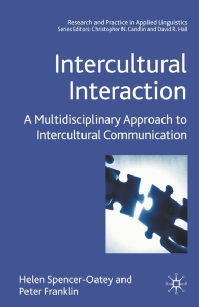 A Multidisciplinary Approach to Intercultural Communication. Basingstoke: Palgrave. Spencer-Oatey, H. (ed.) (2008) Culturally Speaking. Culture, Communication and Politeness. 2nd edition. London: Continuum. Most of the publications on this page are subject to the publishers' copyright restrictions on access.